WLCB / WCR began it's humble life as Wicklow Ragata Radio in the summer of 1982 on 1512kHz. This was a festival week type station for the Wicklow Ragata festival. The broadcast was so successsful, they became a full time operation. 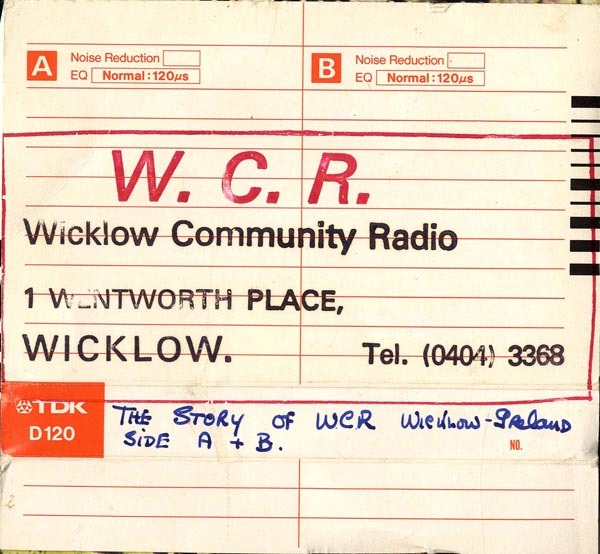 They called themselves Wicklow Community Radio for a time before a slight name change to WLCB, with a new transmitter on 1602kHz. 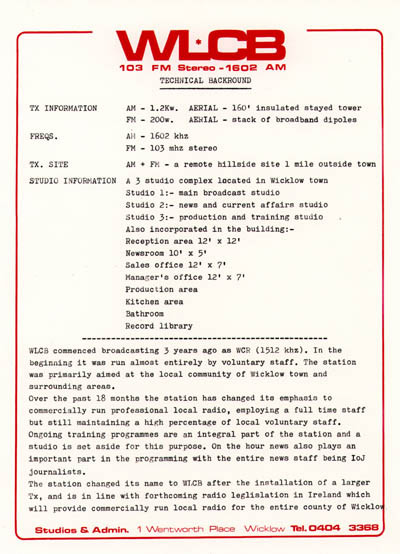 Some statistics from the the Anoraks UK frequency listings, which were published from time to time. 5th November 1984 - WCR listed on 1512. Nothing on 1602. 26th July 1985 - WLCB listed on 1602. July 2nd 1986 - WLCB on 1584. January 26th 1987 - WLCB back on 1602. 21st October 1987 - Viking 105 listed on 1602. 5th July 1988 - Listed as FM only for Viking 105. WLCB was on 1584 during a visit in October 1986, and over coffee managing director Leo Doyle was telling us the reason. He had lost the main 1602 transmitter, due to theft, at the remote hillside site. 1602 was being left clear just on the off chance the transmitter found a new home and was put back on the air, as it was.. on 1602.. where a trace could easily be made!! Hence the standby transmitter was on 1584!! 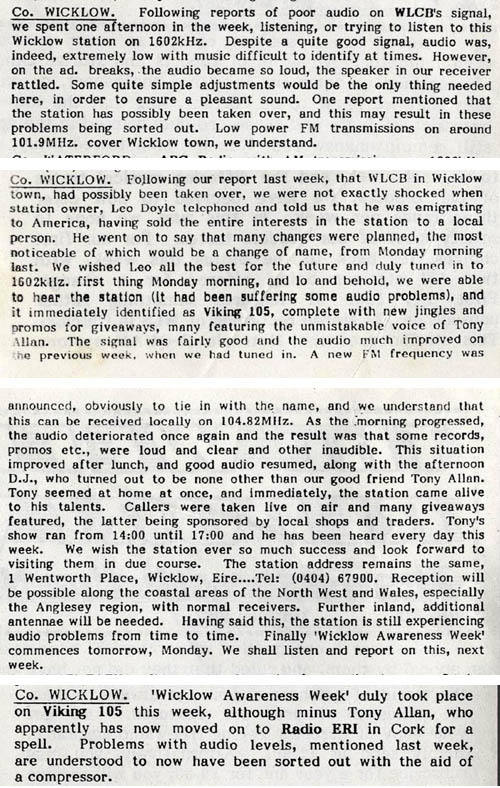 During the visit in 1986, it was also verified that WLCB emerged as suspected from Wicklow Ragata Radio / Wicklow Community Radio. The station later relaunched as Viking 105. Below are the stickers and headers etc that we have found so far in the archives, as well as the documentary for WCR. Also initially there is only one recording of WCR on 1512kHz made in Scotland, so it is a bit noisy. A few snippits of news were easily gathered from the Anoraks UK weekly report, late May - early June 1987. 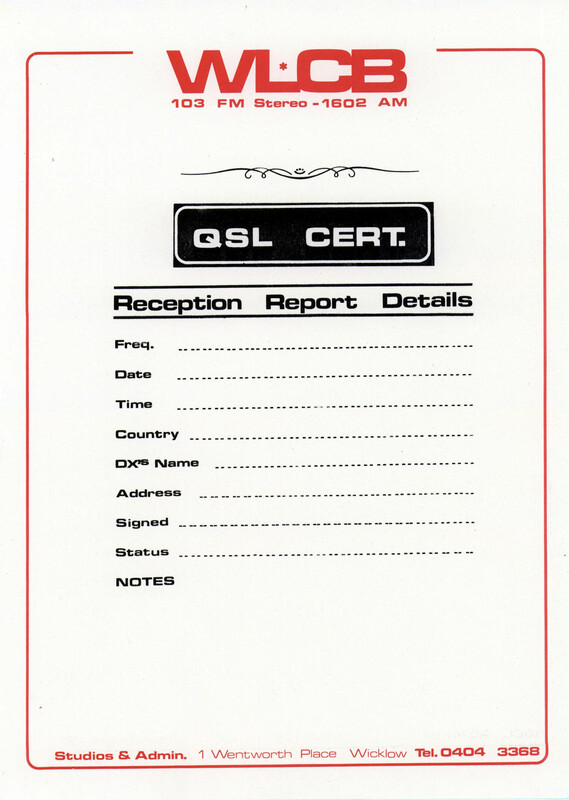 Click here for higher res pdf of the above two documents. WLCB supplied Svenn in Sweden with this tape. It was a very bad quality, bassy copy, and we are trying to locate the master. But as is always the case, a poor recording is better than no recording at all. There is also a pretty noisy recording made in Scotland from 1984. There is some noise from television sets. Presenter is Leo Doyle. Gary has also supplied a few more recordings, early April 2016. 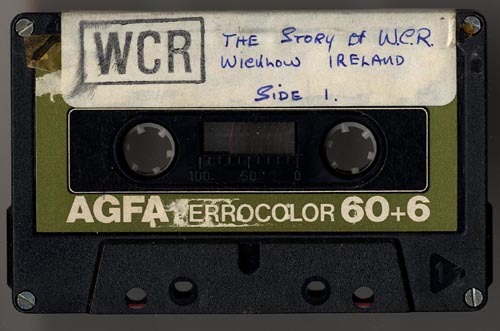 The 1982 recordings made in Scotland of Wicklow Ragata Radio are much poorer than was thought, ie poorer signal... But listenable to am radio fans. A few will be uploaded soon. NB: Files dated 21/10/84 were originally wrongly dated 10/10. Anyone who collects these recordings, it might be worth checking your files.